With a mineral glass scratch proof screen, a stopwatch function, and e-data memory storage the watch is perfect for every day. 20 bar/ 200 metre water resistant! 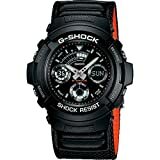 What do you think of this deal from G SHOCK?